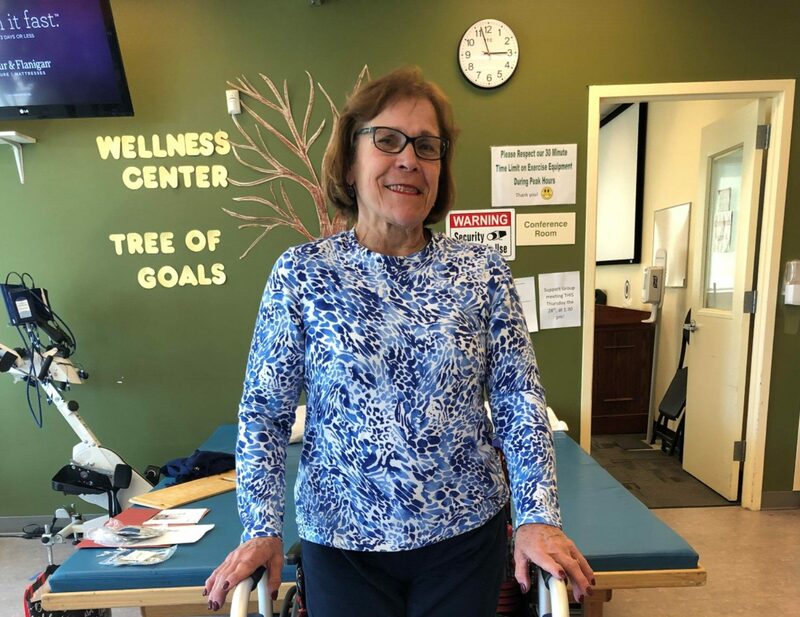 Each month, the Health & Wellness Center at Magee Riverfront honors one of its clients as the “Wellness Triumph of the Month.” Today, meet Arlene. One summer night in 2016, suddenly and without warning, Arlene Sander lost function of her lower limbs. She was taken to Thomas Jefferson University Hospital where doctors diagnosed her with a spinal abscess and bacterial endocarditis. She continued her recovery at Magee Rehabilitation, working with Miko, Bianca, and many other staff members at the main hospital for nine weeks. Eventually, she moved on to sub-acute care and finally returned home for home care. In spring 2018, she heard about Magee’s Gaining Ground program and decided to join. After completing the program, Arlene joined the Wellness gym, where she uses the Stim Bike and practices walking on a harness. She is very grateful to the LT aides, Wellness trainers, all of Team Magee, and especially her husband, Tim, who has been so supportive and helpful!